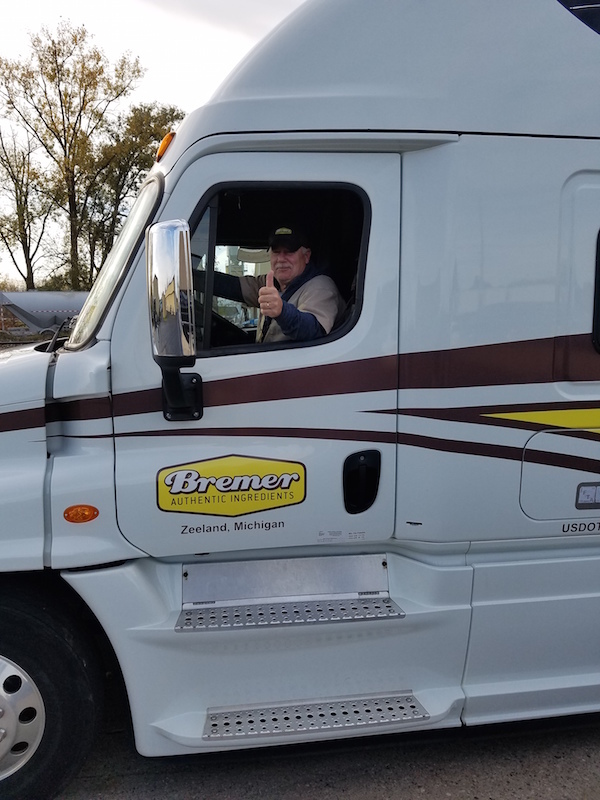 Dave Dalman has been a part of the Bremer family for the past 44 years and recently will be passing the baton on. Please read on in Dave’s own words and share in a big thanks to Dave for all his hard work over the years. My name is Dave Dalman. Many of you know me as a driver for Bremer Authentic Ingredients. As you explore this website, you might know me by recognition or by name. After 44 years working for B.A.I. — I am retiring. I know a lot of you in a personal way and I thank you – not only for being a loyal customer but also for being a personal friend. We have shared life stories about our families through the years and not only have you become a part of my family but also Bremer’s family. Bremer Authentic Ingredients has always been there for me and I know when you do business with them, you will feel like family as well. Sincere thankfulness to all and trust that Bremer Authentic Ingredients will continue to partner with you in the future ahead. Nagelkerke’s career has given him more than 35 years of experience—all of which are in the food and ingredient industries—in distribution with a strong knowledge of food service. When he saw the opportunity to become a part of the Bremer team, he immediately knew it would be a good fit, as Bremer’s values fit so closely to his own. The energy around the office and beyond has been refreshing as Nagelkerke gets familiar with his surroundings. His passion is inspiring those around him, and their energy is motivating him. The core staff of Tim Malefyt, Todd Gifford and Tracy VanDenbeldt will continue doing what they do best while working alongside Nagelkerke. Most of Nagelkerke’s career has been focused in Michigan and northern Indiana markets, and he’s thrilled to be fully immersed in the region, particularly considering he grew up just outside of Grand Rapids and has raised five children in the area. In his first few months, Nagelkerke could be spotted anywhere and everywhere Bremer operates, visiting warehouses, talking to customers, meeting with colleagues and tagging along with drivers on deliveries. Dan believes in truly getting to know his customer base inside and out: how they think and what they really want to make their business successful. Bremer has always counted having their own dedicated trucks as one of its most valuable advantages, and Nagelkerke immediately recognizes the value of that goes well beyond the convenience of merely having a dedicated trailer. It’s the long-term human relationships on which Bremer prides itself. Not limited solely to ridealongs, Nageklerke has been using his first few months to learn every aspect of the business. Along those lines, Nagelkerke is actively working to determine any niche markets that might fit with Bremer, noting Bremer’s recent success servicing the beverage industry throughout Michigan. He intends to continue Bremer’s success dealing with a large customer base, but is there an opportunity to add a market to the portfolio? Nagelkerke’s commitment to customer service and desire to build on a company that is already focused on customers will undoubtedly propel Bremer’s success in the future.